Valentine’s Day is nearly here so it’s time to start thinking about what you are going to give to the man in your life. If you’re like me, you think that DIY gifts are the best. Of course, men are often difficult to buy for or to make something for, which is why I looked around and found these 25 amazing DIY Valentine’s Day gifts for him that he is sure to love. Whether he like working with his hands or he needs some personalized décor for his office, you’re going to find the perfect DIY gift in this list of DIY projects. I really do love making my own gifts. I just feel like the gift has a much more personalized feel when you make it. Many of these can be made with recycled materials or craft supplies that you probably already have on hand so they are basically free to DIY. That means that not only do you get to give him an amazing gift, you get to do it without blowing your budget. Save that money for a night out or a nice romantic weekend. You can make a wonderful gift without spending any money! And since Father’s Day is just around the corner, be sure to take a look at these 25 manly DIY Father’s Day gifts, too. From beautiful handmade cards to lovely art and even some functional digital necessities, you are going to find the perfect gift to give the man in your life and make his Valentine’s Day really special. Most of these only take an hour or so to complete so you have plenty of time to get them done before that special day arrives. And, you should take a look at these 25 amazing hand sewn gifts that you can make, as well. If you love giving DIY gifts, you are going to really love these. This is the most adorable way to showcase your relationship. You create little hearts out of maps and show off the locations of where your relationship began and how it has transformed over the years. This is a wonderful gift to show your special someone how much you care and it’s a really cheap and easy Valentine’s Day gift to DIY. It’s perfect for his office or to just hang on the living room wall. You can never go wrong with DIY gifts for the home. This is a wonderful gift for anyone who loves puzzles and games. You create this secret message in a bottle using numbers instead of letters and he gets to decode the secret message that you have for him. This one is super easy and you can make it in an old glass soda bottle or a mason jar. The message pieces can be a DIY project, as well. If you have a card lover, this is a great DIY gift for Valentine’s Day. You make this from a deck of cards and you can get cards at the Dollar Store for about a dollar per deck. Then you just treat them like a scrapbook and tell him all of the reasons – or 52 of them – why you love him. 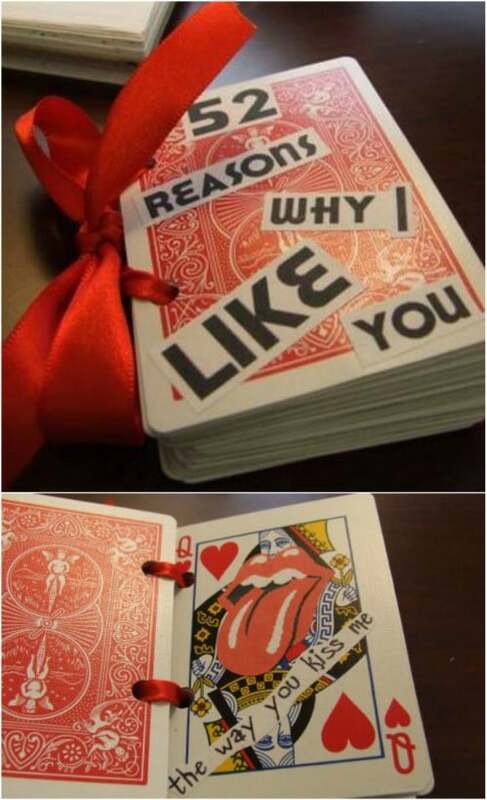 You can do these with a standard deck of cards or combine one of his favorite hobbies and get specialized cards. Whether you are making a Valentine’s Day gift for a boyfriend or husband, this little all about him book is great. It is super easy to make and it’s pretty inexpensive, too. If you have chosen to make the presents this year, this is definitely one that you want to consider. You just fill the book up with all of the reasons that you love him – or like him – and you can make it as thick or as thin as you want. Take a plain pair of red or white boxers and dress them up to make the perfect Valentine’s Day gift for him. This is a cute project and it is really easy. You can even personalize this one by adding cute little words or phrases to the hearts. 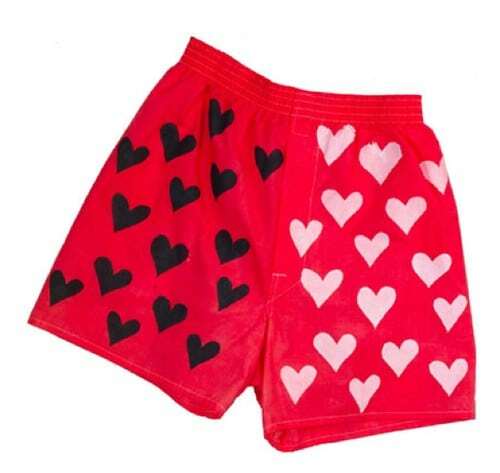 You can buy heart boxers of course, but doing them yourself is such a great way to show him how much you really care. If you plan to serve him a cocktail on Valentine’s Day, this conversation heart vodka is the perfect precursor gift. This is a really easy to make DIY gift for the holiday and if he loves vodka, then you are definitely going to get the love of the year award. You even add a little recipe for him to make his own Valentine’s Day cocktail. Give him the gift of remembering the day that you met, or got engaged or married, with this best day ever DIY keychain. This is a wonderful gift for someone who already has everything and it is really easy to make. What man doesn’t love a great keychain? And, you can ensure that he never forgets an anniversary because the date will be right there on his keychain! You could also make him a keychain from an old bottle cap. DIY bottle cap projects are so much fun! 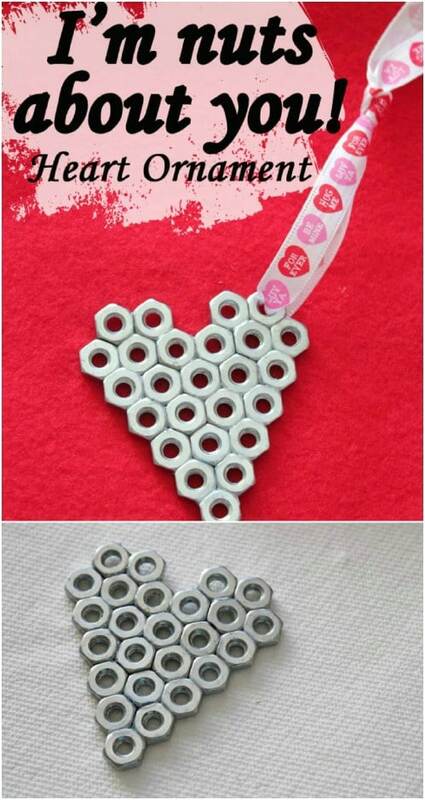 Cement is definitely a man’s gift and these little cement conversation hearts are sure to make him smile. 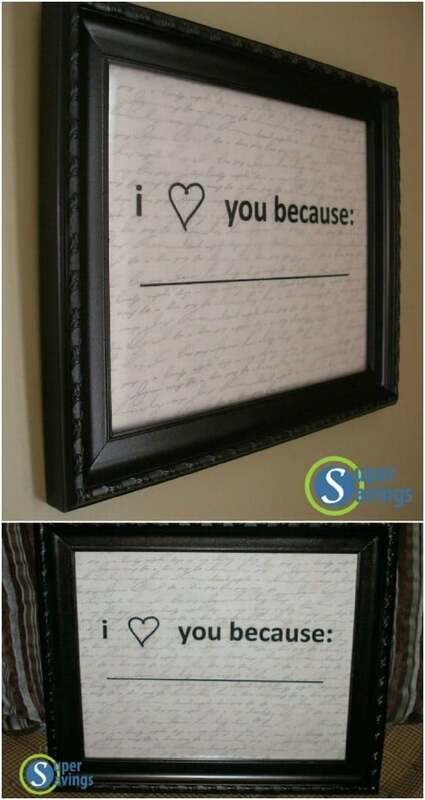 You can do these with any message that you want to convey, which is what makes them the perfect Valentine’s Day gift. Whether you are in strong like with someone or you have dedicated your life to them, you can use these DIY cement conversation hearts to tell him how you feel. What a perfect gift for the man in your life! This DIY charging station is a great Valentine’s Day gift for anyone on your gift list, particularly your special someone. This is a really easy gift to make and it makes charging those iPads, iPods and phones so much more organized. This is great for his office or he can keep it on a table in the living room, and there is a space to recharge all of his favorite devices. If you have a man in your life and you need a really unique, and really tasty, Valentine’s Day gift, I have two words for you…bacon roses. Imagine giving him a dozen roses that are made of bacon! These are the flowers that are made just for men…and women will love them, too. They are super easy to make and did I mention that they are made of bacon? They’re also super delicious! If your better half is on a different time zone than you, give him the gift of time. 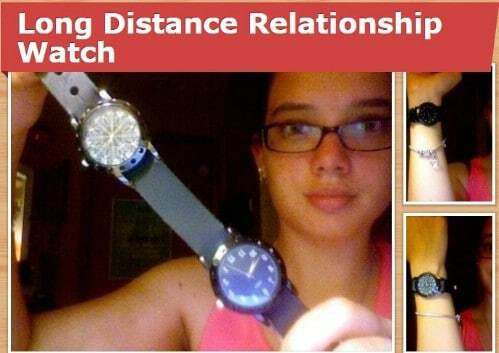 You can easily make this DIY long distance relationship watch, which shows him what time it is where he is and also what time it is where you are. In fact, you should make two of these so that you will have one, as well. You’ll just need a couple of watches for each one and the process is really simple. Who needs to carve your initials in a tree when you can do it in this little tree based candle? These are really adorable and so easy to make. They have such a great rustic look, thanks to the base, which he will love and you can carve your initials right into the candle so it will be a constant reminder of the love that the two of you share. I really love DIY candles and your man will, too. Turn a plain mug – that you can get at the Dollar Store for a dollar – into a mug with a message and then fill it with his favorite treats. You can write any message that you want on the mug with sharpies and then just add in some chocolates or other candies. Or, if he loves flavored coffees or teas, add those. This is a really versatile gift and one that is so cheap and easy to make. Here is another wonderful treat for his Valentine’s Day that is made with bacon. Just turn that bacon into these adorable little hearts. He will love these much more than those little candy hearts and you can turn these into a wonderful meal. 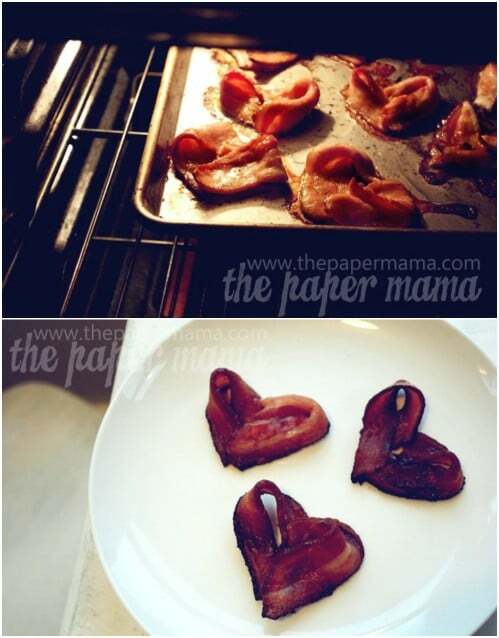 Make him breakfast in bed with bacon hearts or just give him the hearts to eat whenever he wants. They’re easy to mold and so tasty! 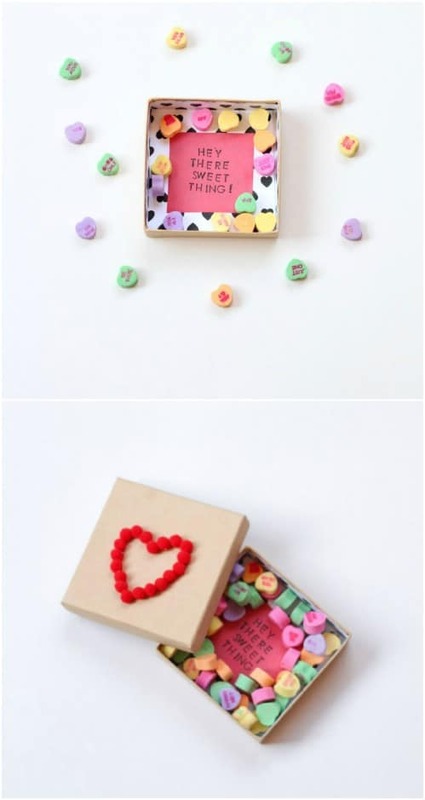 If you plan to give him conversation hearts or other Valentine’s Day candy, you can put that candy in a little DIY candy box. Add your personal message inside the box and then fill it with the candy that you prefer to give. This is such a simple gift to make and you get to completely personalize it however you want. 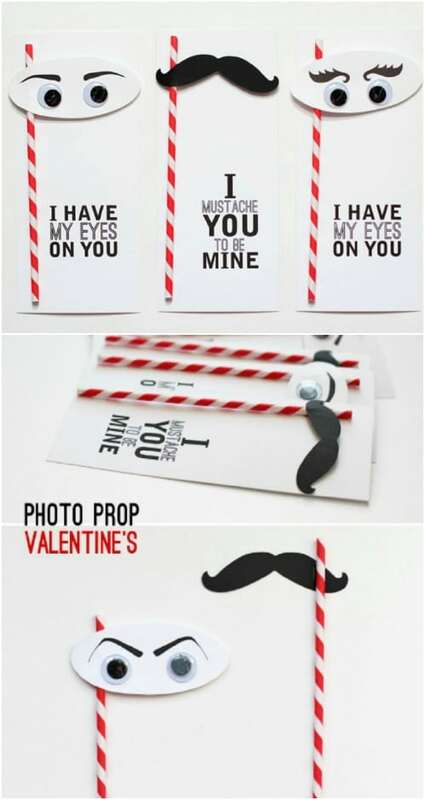 I love these little moustache straws and Valentine’s Day cards. If you “moustache” him to be your Valentine, these are the perfect way to do so. You can use the concept for straws, cards or just little decorations. Just choose your favorite sayings – puns are great – and make them from construction paper and googly eyes. I promise you that he will adore these. Create a beautiful frame and tell him why you love him with this little DIY project. This one is super cheap. You just have to buy a frame at the Dollar Store, which you can get for about a dollar or so. Then you fill it with reasons that you love him. I adore this idea. It’s very unique and personal and you get to tell him all of the reasons that he is so special to you. This is a great way to repurpose old picture frames. This little heart ornament is perfect for Valentine’s Day for a couple of reasons. First, it is a heart so it matches the holiday perfectly. And you make it from nuts, so it is really perfect for the man in your life. He can hang this in his office or even from his rear view mirror in the car or truck. Make it whatever size you need and then just add the decorative ribbon for hanging. 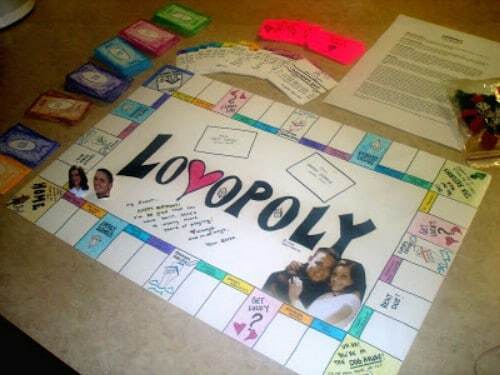 If you love playing games, this Loveopoly board game is the perfect gift for him this Valentine’s Day. It’s a board game like Monopoly, but with a personalized twist. This is such a cute little game to make and to play. You will need houses and other pieces from an actual Monopoly game, or you could make those pieces yourself if you have a bit of free time. Give the gift of your memories together with this great memory jar gift. 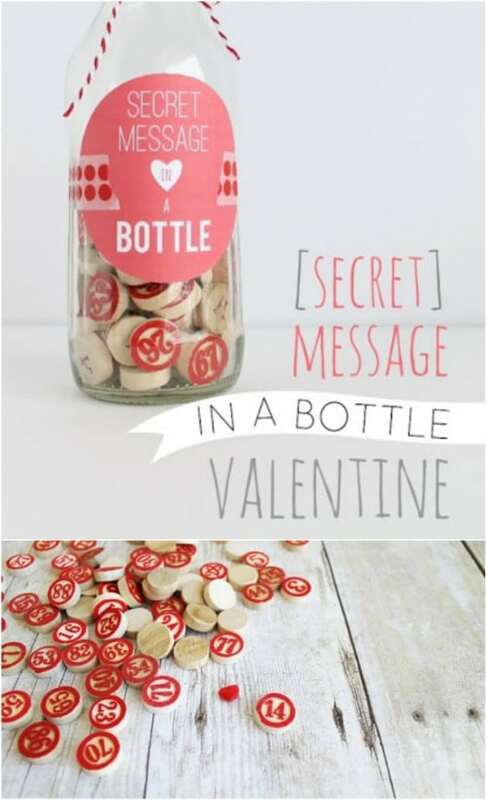 This is a wonderful DIY gift for Valentine’s Day. 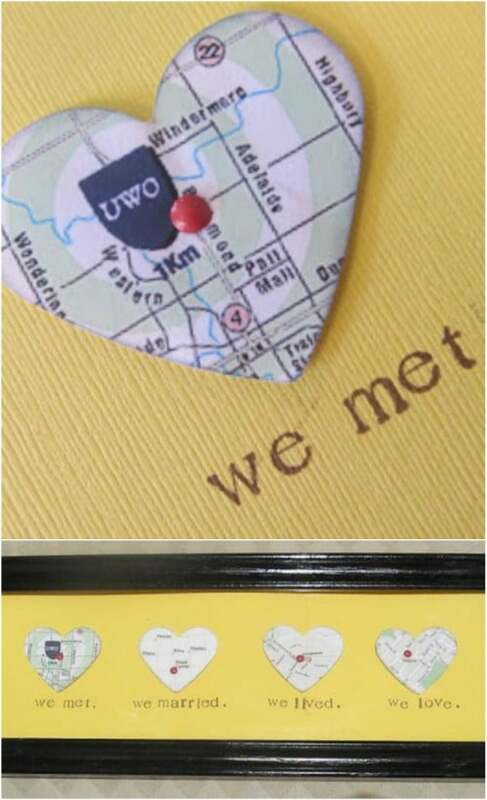 It is super easy to make and it allows you to remind him of all of the good times that you have had together. 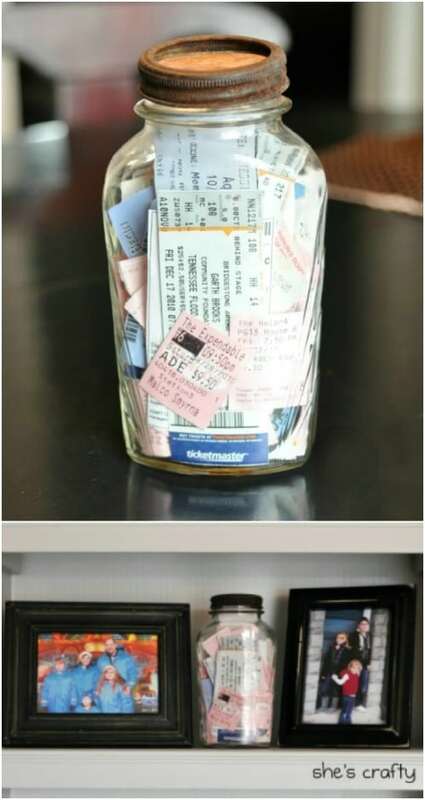 You can put your memories into a mason jar or any empty jar that you have on hand and you can add to it as the years go by. 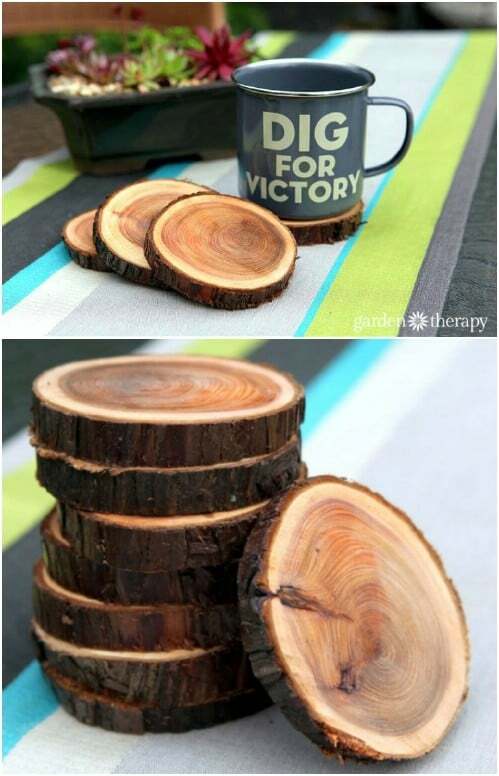 These little coasters are made from tree branches and they are the perfect masculine gift. You will need to know how to saw or at least have someone who can. You just cut them from your fallen tree branch and then seal them to help protect them. They’re rustic and perfect for the man in your life – plus, they will give him the perfect opportunity to use a coaster on your favorite tables. 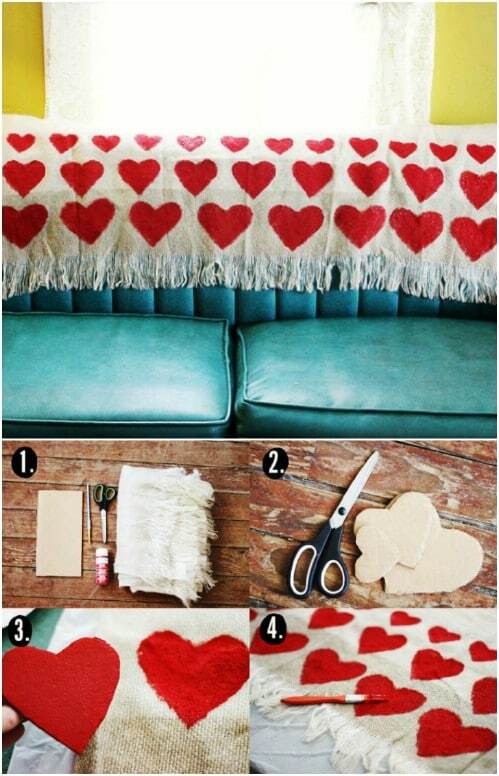 This little heart blanket is really easy to make. Honestly, I would do this on a towel, particularly if the man in your life loves to play golf. You can make him a personalize golf towel by using the same technique or turn it into a blanket if you prefer. If he travels a lot, a blanket would be a wonderful gift. Either way, this is a great DIY gift and it is super easy to make. 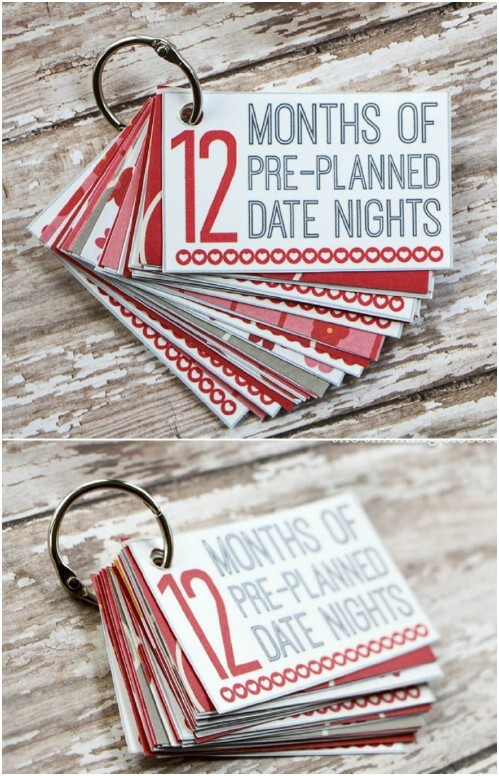 I really love how creative this date night card project is. You plan out 12 months of date nights for your love so that you always take time to spend some one on one time together. Your dates can be anything that you want – just be creative and add in things that both of you will enjoy doing together…maybe dinner at your favorite restaurant or a DIY project that you can do together. 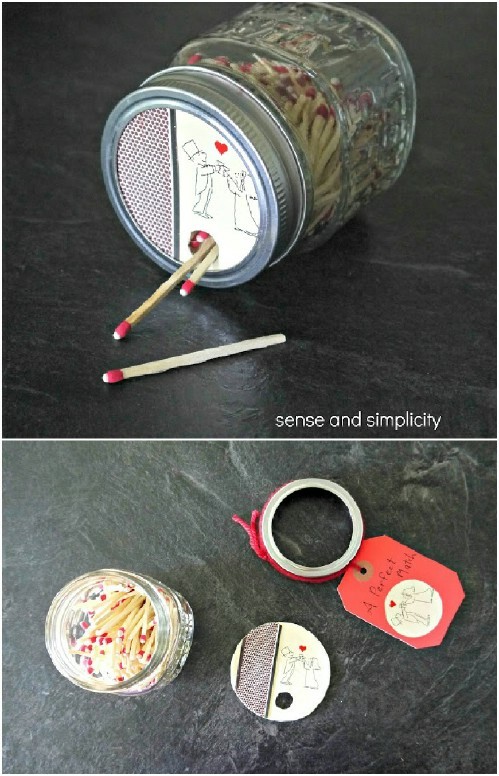 This matchbox that you create from a mason jar is a great way to show him that he is the perfect match for you. This is a cute little tool to add to his arsenal. He can keep it on the fireplace mantel for lighting those romantic fires or just have it on hand for whenever he needs a match. The gift is in how you decorate it and he will adore it – and you for making it for him. You have to love a good mason jar DIY project. These constellation cards are so cute and are great for giving to the man in your life for Valentine’s Day. 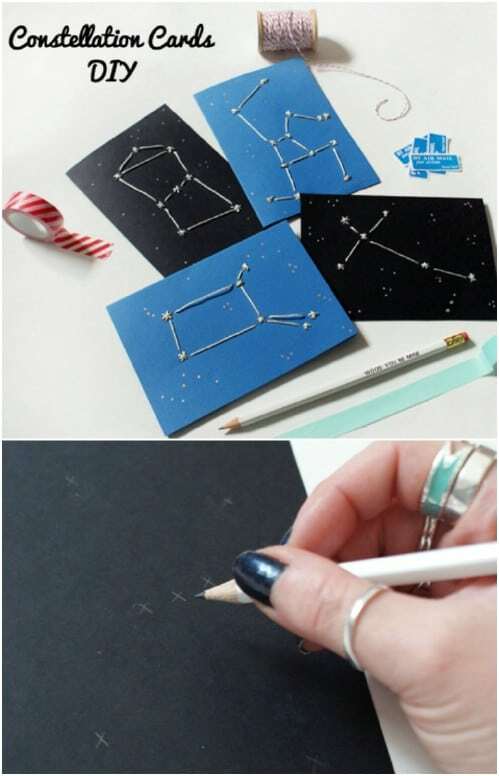 Choose his favorite constellation or make one for each of the constellations – however you prefer. They are so easy to make and they are sure to show him just how starry eyed he makes you. DIY – best way to show that you care! 🙂 Nice one!